James first came to HRDC to be part of the SNAP Employment & Training program, a program that helps participants in the Supplemental Nutrition Assistance Program (SNAP), also known as food stamps, achieve their self-sufficiency goal by providing opportunities for work experience, education and job retention training activities. One-on-one support is provided through case management to assist with obstacles which prevent individuals from becoming gainfully employed. When James was referred to HRDC he met his case manager, Penny. She helped James completed weekly itineraries, took him shopping for work clothes, as well as get bus passes so he could get to school and work. James had already begun working towards his dream of being a chef. He had been hired as a part-time cook at Applebee’s. The next step was to develop his culinary skills even further. That’s when James joined the Culinary Job Skills Training program in the Fortin Culinary Center at the Billings Food Bank. The 12-week course is designed to teach future chefs everything from culinary terminology, knife skills, and food and kitchen safety, to preparation of fruits, vegetables, stocks, sauces, meats, poultry, pastas, and pastries. Over the 12-week course, James saw his classmates disappear one by one. The program began with 22 students; James was one of only three to graduate. 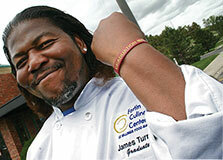 James was able to use his part-time job at Applebee’s as his internship for the culinary program. The program not only gave him improved cooking skills, it also helped turn his part-time job into full-time. James calls the help and support he received at HRDC a ‘blessing’ and encourages anyone who needs help to explore the programs at HRDC.